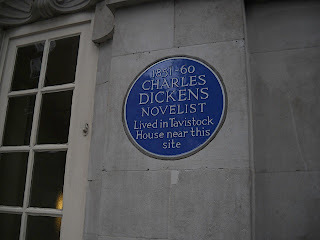 Just about a month ago, I traveled down to London to be an audience member on the Radio 4 Bookclub. I truly *heart* Radio 4. Sure it's got its problems. Maybe too much comedy radio plays. Maybe a few too many airings of the Archers. It's still my favourite radio station ever. I listen to it just about all the time. Except when I'm writing essays and have to concentrate. Then I listen to Radio 3. Anyway, Radio 4 have a great bookclub series. They invite an author on, get some listeners to read the book, come in and discuss in a little studio. Having tried to get a radio bookclub going a few times in Sydney, it was exciting to be a listener/reader for this one... especially since the book being discussed was The God of Small Things and the author, Arundhati Roy, was going to be there! I'd been a fan of Arundhati Roy's politics for years. She's a hero. But I hadn't read her novel until Monika gave it to me as she was moving to New Zealand. I was helping her pack up to leave Sydney that day, and my eye wandered over the cover. "I've never read The God of Small Things," I said. "Whenever I tell someone I'm Indian, the first question I usually get is, 'Have you read The God of Small Things?' I feel like they don't think I'm a proper brown person when I say I haven't." "Take it," Monika said, "My gift to you: you can be a proper brown person." I'm lucky to have friends who know when I'm being funny and choose to play along. So, I read the book. I wasn't all that impressed, honestly, and some of you may remember my review here. Cut to me in Manchester on any random night, listening to Radio 4 and the rain, and at the end of that month's bookclub show, they invite listeners who want to be at a bookclub with Arundhati Roy to write in. Good thing I can type fast like lightning. I wrote in. They wrote back. I got myself another copy of the book, because Monika's gift to me was still in Sydney, and I bought a ticket to London. On June 6th, I was so excited about being in London, that I found myself walking down the street with a big stupid grin on my face, American-tourist-style. "I'm going to be in a BBC building," I thought, "Oh, wow!" To be fair, it wasn't raining or even foggy or cold, so I did have *quite* a lot to be happy about. 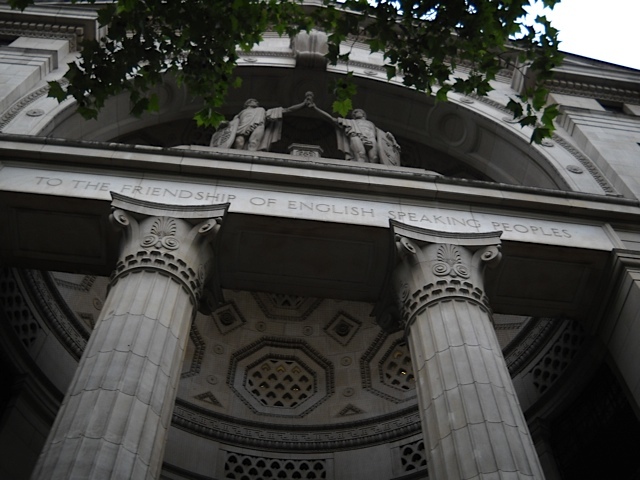 I had a few hours to kill before the show, which was being taped in Bush House. Which just happens to be right near Covent Garden... which just happens to also have a Tatty Devine boutique. I love small coincidences. I dropped by and bought a new necklace (pictured below), and then wandered around, enjoying the Covent Garden cafes and streets. I found a truly wonderful bookbinder supply shop, and they even do mail-orders. FAB. And Charles Dickens once lived near here! London is so old and cool and interesting and overwhelming, I nearly passed out. Finally, it was time to go to Bush House, and get in the studio. 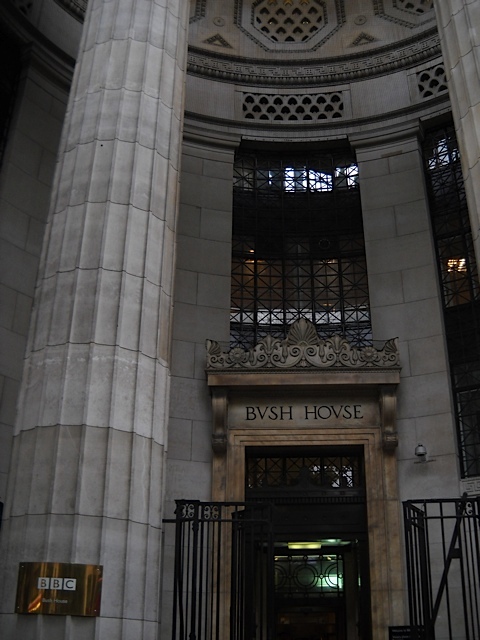 Bush House is a gorgeous old building with winding corridors and marble stairwells and a courtyard. They sort of ushered us through very quickly, though, so I only got exteriors. The studio itself was nothing to look at, but they did give us some free BBC wine. 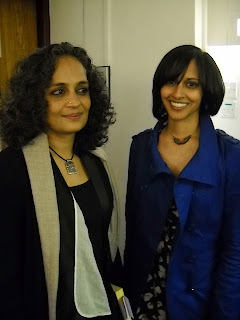 And I got to take a photo with Arundhati Roy, a proper brown woman if ever there was one, by my account. The bookclub taping went well, and I even got a question in! But of course, I don't know if it'll end up in the final edit of the show. It won't go to air until October– don't worry, I'll put a link up when it does, especially if my question makes the cut! I left the studio and headed back toward the train station, still beaming and thrilled to have met Ms. Roy, and been in a BBC studio. It was just a lovely day altogether. For those who haven't been on an British rail train, the seating on the trains here works like airplanes. As in, you get assigned a seat when you buy a ticket, you sit next to some stranger. I found my reserved seat, pulled out my computer, and started watching some This American Life: The TV show. Some guy sat next to me, and as you do in airplanes, we nodded at each other. Made short comments throughout the train ride. Near the end, I muttered, "Christ, it always feels longer coming back. I swear it didn't take this long this morning." Stranger said, "You went into London and back in one day?" I explained that I had to be in Manchester the next day, that I had a chance to meet Arundhati Roy, that it was worth it, even if it meant six hours of train in one day. The train pulled into Manchester Piccadilly, and as we shuffled onto the platform, he asked if I wanted to get a drink. "Sure," I said, because I am adventurous and spontaneous, and because I trust this city to put amazing new people in my path. I will not turn them away. His name's Mark, and he hates Manchester. Or at least he did then. I told him how much I love this city, and he looked surprised. When he told me why he hated it, I quickly diagnosed the problem. He had not been to the right places. He had not seen Chetham's, he had not been on a single history walking tour. He had not been to the Knott Bar. He had not made the right friends. "It's your lucky day," I told him, "I am an *excellent* friend to have in this town." Too late. He was leaving in three weeks, he said, to go back to Scotland, and then hopefully London. As regular readers and my dear friends and family surely already know, I don't give up so easy. I was determined to show him, in what little time he had left, that this town could be amazing. I should get paid by MCR tourism for this kind of work, seriously. The upshot? He left for Scotland last week, but he's coming to visit soon. Another chance to convince another convert.